Taiwan based Sunshine PV is reported to be the initial turnkey customer and has achieved the first CIGS thin film photovoltaic (PV) module out milestone. The Sunshine PV datasheet implies module efficiencies below 8%. At PHOTON’s 2nd PV Thin-Film Conference on Feb. 2, 2010, centrotherm photovoltaics AG (ETR:CTN) CTO Dr. Peter Fath presented “Centrotherm’s CIGS Technology: Case study: Results from the world’s first Standardized turnkey CIGS line” with updates since “centrotherm photovoltaics achieves milestone in thin film area: Successful production of first CIGS modules for Taiwanese customer” on January, 18, 2010. “Sunshine PV installs CIGS thin-film PV module line from Centrotherm” by Nuying Huang and Adam Hwang for DIGITIMES first asserted Sunshine PV is the centrotherm turnkey CIGS (Copper Indium Gallium diSelenide) customer. Dr. Fath said the Taiwan production line had been ramping up for two months after a certain delay and “we have to first reach 8% efficiency and then 10% efficiency” with the 1.5 m2 (square meter) modules. centrotherm first researched a lab cell sized 0.5 cm2 (square centimeter) with 14.9% maximum and 11.5% average efficiency. The technology proof of concept and basic process development were scaled to a 30 cm2 minimodule pilot line achieving about 10.5% efficiency despite interconnection losses. The CIGS turnkey production line scales the minimodule to 1.5 m2 (square meter) with a guaranteed efficiency of greater than 10%. 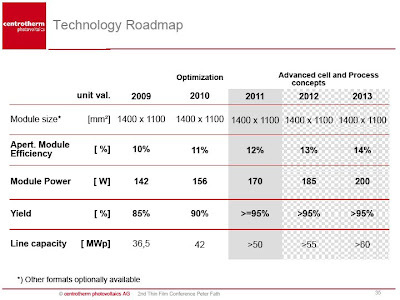 In order to compete with the moving target of crystalline silicon solar modules both increasing in efficiency and decreasing in cost and price, centrotherm believes they need to achieve 2011 technology roadmap targets of 12% aperture efficiency, 170 Wp (Watt-peak) power, and minimum 95% yield for CIGS module volume production. The PV market has changed from one dominated by silicon shortages and high spot prices to oversupply, and Chinese crystalline silicon solar module spot pricing has declined to $1.7-1.85 per Watt in early March 2010 according to DIGITIMES. 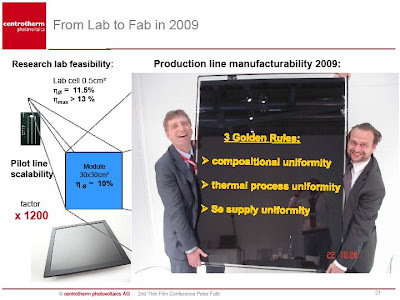 As a result, the boom market for single junction a-Si (amorphous Silicon) thin film turnkey production lines from Oerlikon Solar and Applied Materials has almost halted, and their customers are forced into tandem junction equipment upgrades to have any hope of competing with CdTe (Cadmium Telluride) thin film and crystalline silicon solar modules. Our key target customers are now first strong pioneers which want to go into CIGS or which want to go into Thin Film but we prefer to have companies that have some technology or some synergy technology on the product portfolio or market synergies. For now, photovoltaic or thin film newbies need not apply. Instead, centrotherm is seeking manufacturers with niche market entry strategies such as BIPV (Building Integrated PhotoVoltaics). In addition, centrotherm is targeting existing top 20 crystalline silicon manufacturers interested in thin film product diversification and thin film (a-Si) manufacturers looking to convert to higher efficiency CIGS production. I think I got the calculation right unlike the last time.